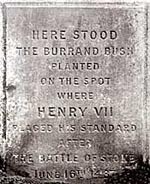 When the battle was ended, Henry VII rode to the top of Burham furlong (to the south of the village of East Stoke) and placed his standard as a token of victory. This commemorative stone marks the spot. A little further down the valley of the Trent, as we journey towards Newark, is the village of Stoke, famous in history as the scene of one of the most stubbornly-contested battles ever fought on British soil. On June 16, 1487, the supporters of Lambert Simnel met the royal forces in the broad fields which stretch between Stoke and Thorpe, and there stood face to face on that fateful day some 15,000 or 16,000 men, waiting for the signal which should precipitate them against each other in deadly strife. The details of it obtainable are not very minute, for the period was not prolific in chroniclers, or in literary workers of any kind. Polydore Virgil was in England, but is not supposed to have written much of his history before the succeeding reign. Blind Bernard Andre alone wrote a contemporary record of any extent, and this gives very meagre information of Stoke field. In no period, says Mr. Gairdner, are the sources of history so scanty. But such as they are they enable us to form an accurate idea of the importance of the battle which was fought at Stoke, and of the grave issues which depended upon it. They show that in the violence and vigour of the combatants, and the extent of the slaughter, there had been few engagements in this country of equal magnitude. It is a curious story of daring imposture, fierce rivalry, and stubborn and unyielding courage. German mercenaries of the 15th century. From the contemporary accounts we learn that the armies encamped at night-time, and when morning dawned, the King offered battle upon the broad plain which stretched between thema fair plain, meet for the trial of such a conflict. The King delivered a short speech to his troops to urge them on to vigorous action. He denounced the Earl of Lincoln as a false man, who had no excuse for his iniquity, and spoke of his impudent treachery and dissimulation. He said that the earl was not ignorant of his true race and blood, but had always been an opponent. God, however, who punished evil-doing, would remember their just cause and the iniquities of the other side, and would make them triumphant against their enemies. Whilst the King was animating the spirits of his followers, the Earl of Lincoln was busy calling upon his men to remember his honour and their lives. Having finished his exhortation, he promptly accepted the royal challenge, and came courageously down to meet the Kings forces. Whereupon, both armies joined in a hand-to-hand combat of the most furious description, the royal troops making the air resound with shouts of King Henry! Both sides were armed with swerdys, speres, marespikes, bowes, gonnes, harneys, Brigardynes, hawberks, axes, and many other weapons, and they used them with the utmost vigour, cleaving each other to the ground with great rapidity and desperation. Martin Swartz showed much nimbleness and valour, and the Irish fought manfully, but being almost naked, were stricken down and slayne like dull and brute beasts, which was a great discouragement to the rest of the company. For a long time the victory was doubtful, but the Kings forwards being full of people, and his wings well fortified, the enemy were compelled to give way. One by one the leaders of the rebels were struck down, and though they contested the ground inch by inch, they were unable to effectually withstand the terrific onslaughts of the Royalists. As a final effort, the rebels turned their whole strength upon the van of the Kings army. Hastily rallying his forces round that centre, the King repelled the attack, and drove the rebels pell-mell down the ravine leading to Stoke Marsh and Fiskerton Ferry. Here the slaughter was terrific, and a thick stream of blood flowed down, giving to the spot the name of the Red Gutter, a name which has clung to it to this day. Of the rebel leaders, the Earl of Lincoln, Martin Swartz, and others were slain, and many taken prisoners, including the impostor Simnel and his priestly tutor. Scores of men were drowned in attempting to recross the Trent. Of Viscount Lovel, the end is unknown. Some say he was drowned in the Trent, others that he was killed on the battle-field; while there is a tradition that he escaped to his residence, where he secreted himself, and perished through the negligence or forgetfulness of his servant, for want of food. It is a curious circumstance that during alterations at Minster Lovel in Oxfordshire, in 1708, the skeleton of a man was discovered in a large vault underground. You have a new warrior. Who was called by the name of Martin Swart. To threaten to do great marvels? For his troubles with his works. What he threatened was quite averted. And all received their penalty due. The local relics and traditions of this remarkable engagement are very limited. Mr. Richard Brooke, jun., who wrote a pamphlet on the battle in 1825, says he had heard of bones, coins, and other reliques having been dug up in the fields on the south side of the village, where the Earls centre was engaged after descending from his strong post; but we cannot ascertain that anything has been found in recent years, except a spur, which is in the possession of Sir Henry Bromley. Two field-names, that of Dead Mans Field and the Red Gutter, doubtless bear reference to the battle, and there is a tradition which is worth preserving, and which has not heretofore found its way into print. In Stoke parish, in the valley between Stoke and Elston, there is a drinking-trough supplied by a spring, in reference to the origin of which the following story has passed current in the village for centuriesand there are some families now in the parish whose ancestors were there when the parish register was begun, early in the sixteenth century. A soldier fell in the battle, and a comrade came to his assistance, and gave him water from his bottle. Feeling he was dying, he told his friend that if his soul went to paradise there would arise from the spot where he fell a spring that would flow on for ever. The spring now supplies the modern trough, and it is said of it that it has never been known to dry up in the hottest summer, or to be frozen over in the coldest winter. Of the Red Gutter, the local story is that the soil, which is of peculiar redness, received its colour from the blood which flowed through it! With smiling plenty, and fair prosperous days.